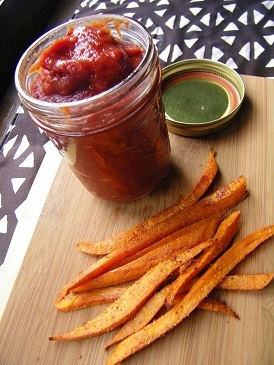 I’m so glad that you tried the ketchup recipe, and thanks for linking back to my blog! 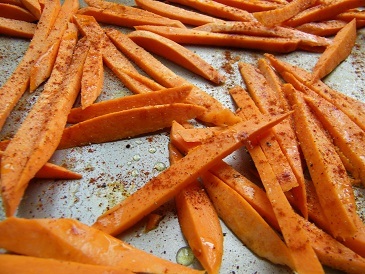 I’ve been wanting to make sweet potato fries, your recipe looks so tasty! Yes I’m glad I tried it too. It was delicious and went well with the fries. I love the content you’ve provided so far – your recipes look great! My first concert was N’Sync and a little someone named Britney Spears opened for them (no one knew who she was at the time)…ah the memories! I loved Spice Girls too! Cute post and I’m looking forward to trying out your recipe. Thank you! I loved N’Sync back then too. I think Britney Spears was my second concert. Oh 90’s pop stars – they do bring back good memories. Thank you. I also love my sweet potatoes. They are even tasty baked with just salt, pepper, and olive oil!